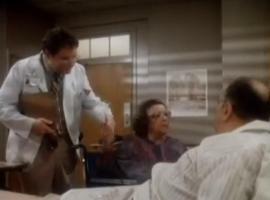 Mrs. Hufnagel demands better accommodations and makes a new friend in fellow patient Murray Robbin. St. Elsewhere's writers took a break from their favorite curmudgeon in season three's "Sweet Dreams", the first episode to not mention the patient since her debut in "Playing God (Part 2)". In "Up on the Roof", she's back, having escaped from her room to complain about the malfunctioning electric bed in her current room and demand a room in the new wing, much to the frustration of her physician, Dr. Wayne Fiscus (Howie Mandel). I've left in the entire shot, which also includes the arrival of visiting bone marrow specialist Dr. Christine Holtz (Caroline McWilliams); it runs for 1 minute, 8 seconds. For the first time, Hufnagel gets two scenes in an episode. After we see her in the opening scene, she pops in on the patient next door in search of a spare bedpan. The patient is aspiring stand-up comedian and colitis sufferer Murray Robbin (Murray Rubin). He's probably the worst comedian in the world, but the two patients bond over their common afflictions. Dr. Elliott Axelrod arrives to find that Hufnagel has taken issue with how he diagnosed his patient. St. Elsewhere Seasons Two Through Six on DVD?